It isn’t easy being a native bird in NZ. It’s a struggle to safely hatch if your nest can’t protect you from possum, stoats and rats. If you can’t fly, cats, stoats and dogs do not make good neighbours. If you are just learning to fly – which often means spending some time on the ground recovering from your last test flight – you are equally vulnerable. Kākā are one such bird. Kākā nest in tree cavities – usually large hollowed out native trees. A typical nest will be between 2-4 eggs laid in late winter. If a successful nest, chicks (or fledglings) might be ready to leave the nest in spring. This is when they are their most vulnerable – flapping about on the ground, making a bit of noise and blissfully unaware of the dangers around them. At Project Rameka we’ve been trying for 10 years to make it more welcoming to native birds. We have been controlling possums, rats, stoats and weasels during that time through a mixture of trapping and bait. 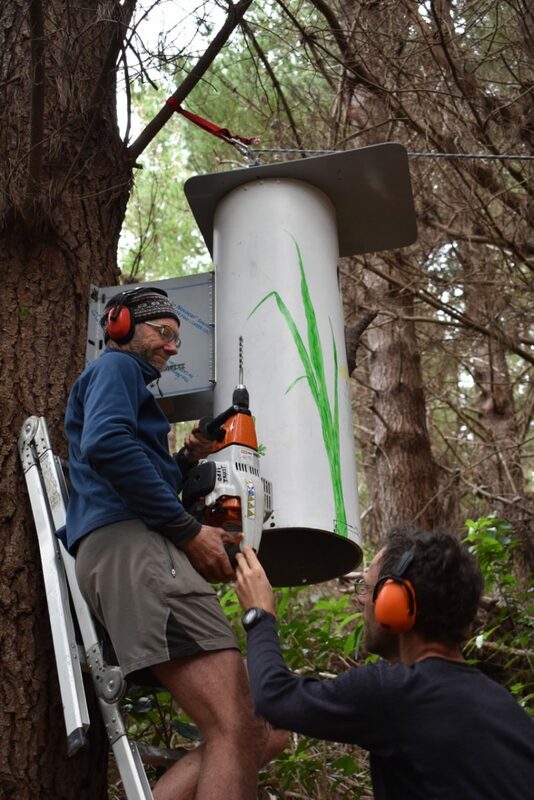 With kākā being recently released in the nearby Abel Tasman National Park by DOC and Janszoon we thought it was time to put out a bigger welcome mat. Enter a Kapiti Coast entrepreneur (Youssef Mourra from Nonsuch Consulting) and Kapiti Menzshed (Nigel and Mark in photo below). 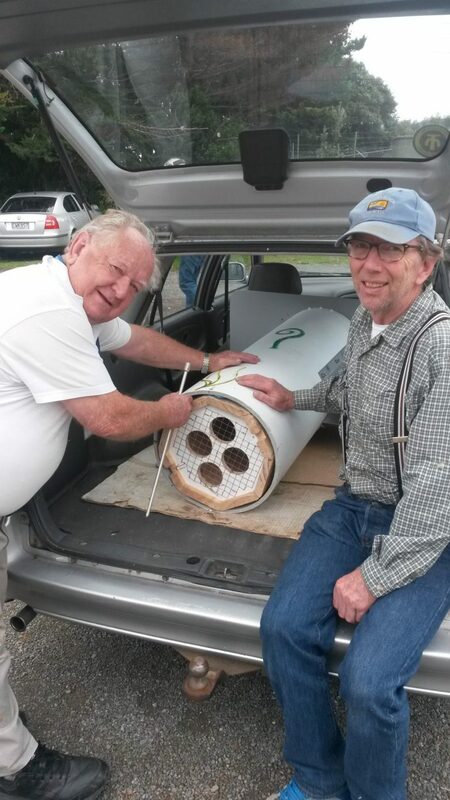 With their generosity we are now the proud owners of an artificial nesting box designed to keep the most persistent of pests at bay. Installed by Stuart, Evan and Andrew in early May it provides a safe haven for eggs and parents, filled with locally sourced wood chips and tasteful wooden interior for climbing practice. We hope it is only a matter of time before we see kākā at Rameka as we are only 4-6km away from areas that kākā were released. If we have any nesting on the Project we will certainly let you know! Thanks again to our supporters, and Wellington DOC for putting us in touch with them. With only a few formal work parties fantastic progress has been made in the last 10 months uncovering a bit of Golden Bay history. Snaking up the west facing slopes of the land added to Project Rameka late in 2015, the Historic Rameka Track weaves its way between limestone outcrops and tomos. Surveyed and built in the 1850s as an alternative route for droving stock to and from the Bay the historic track has laid hidden for a number of decades by a flourishing cover of regenerating native forest and pines. With a walker and biker friendly gradient of 1:40 we are very keen to finish uncovering this path to both expand access for pest control and recreational opportunities in Project Rameka. 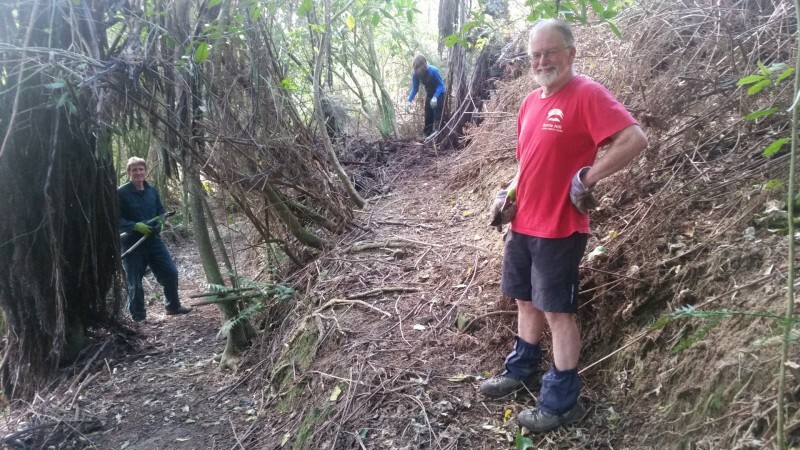 Armed with chain saws and pruning saws over 1000m of the track has already been opened up, spearheaded by Martin Langley, our neighbours Peter and Jim Sim and volunteers such as Phil Castle from Motupipi Hill. The long term plan is to have this track opened up as a formal cycleway linked to the top of The Odyssey track.